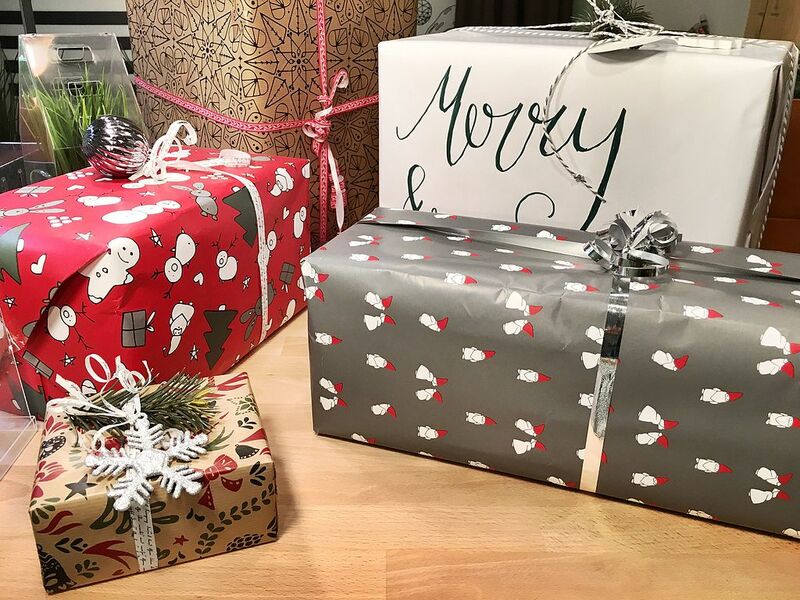 There’s 45 shopping days until Christmas and a little more two weeks away from Black Friday. The holiday gift-giving season is now fully upon us. 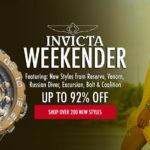 While many may think it’s best to wait until the final shopping days of the season to find the best holiday gift buys, World Of Watches is currently offering the best gift deals right now with our Gift Giving Doorbusters promotion, featuring outstanding watch styles for everyone on your gift list at special “doorbuster” pricing. 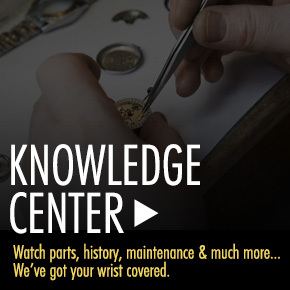 This ongoing weekly holiday event updates every Monday and features highly sought-after styles from today’s most-wanted watchmakers, including Rolex, Breitling, Cartier, Corum, TAG Heuer, Rado, TechnoMarine, Maurice Lacroix, Frederique Constant, Tissot, Alpina, Bulova Accu-Swiss, Victorinox Swiss Army, Swiss Legend, Invicta, Lucien Piccard, Caravelle NY and Seiko. Whether you’re looking for a premium automatic timepiece, a stylish fashion model or a sleek sport watch, there are styles for everyone on your list in a wide variety of price ranges, too. 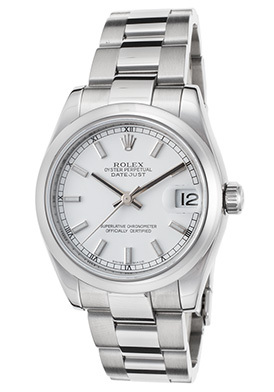 The Rolex Oyster Perpetual Datejust timepiece is an exceptional luxury watch choice for women. 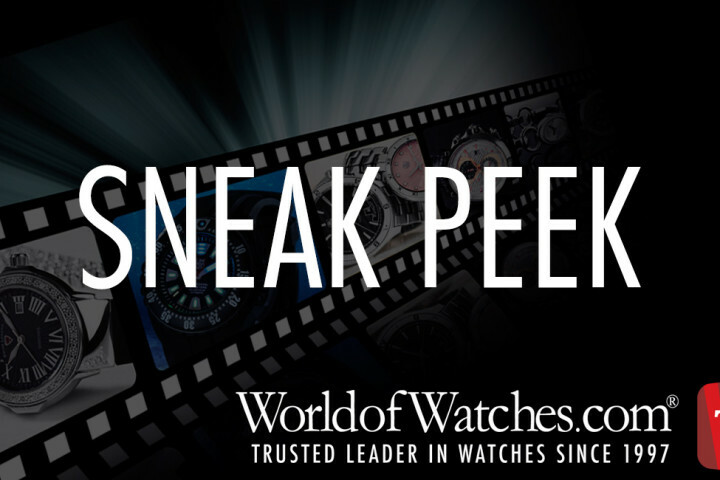 This prestigious Swiss-made automatic timepiece features the signature oyster case in premium-grade stainless steel, highly polished to a mirror-bright glow. The classic triple-link bracelet in premium-grade stainless steel features brushed finished outer links and contrasting polished center links. The silvery white colored dial features polished silver-tone baton hands and outlined luminous baton hour markers. A magnified cyclops window at the 3 o’clock hour reveals the automatic date calendar. Features include a scratch-resistant sapphire crystal above the dial and water-resistance to 100 meters. Rolex Oyster Perpetual Datejust women’s watch is 31mm in diameter, 11mm thick and has been awarded official Chronometer certification from the COSC (Official Swiss Chronometer Test Institute). 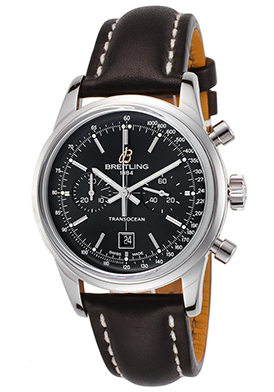 The Breitling Transocean Automatic Chronograph is an exemplary high-end luxury gift choice for men. This precision crafted Swiss-made men’s watch has been awarded official chronometer certification from the COSC and features the 38mm diameter, 15mm thick case in premium-grade stainless steel, presented on a handsome black leather strap with contrasting white stitched detail. The attractive black dial has a tachymeter outer dial, two sub-dials, luminous sword hands and luminous baton hour markers. Features include an automatic date window, small-second and 30-minute countdown timers. Additional features include a scratch resistant sapphire crystal above the dial and water-resistance to 100 meters or 330 feet. The Rado True Thinline Diamond timepiece is an exceptional dress watch gift selection for women. The graceful and lustrous black ceramic case is presented on a supple black rubber strap. The polished rose gold-tone crown adds striking contrast. The attractive black dial shines with rose gold-tone skeleton hands and diamond inlaid sundial hour indices. Features include a scratch resistant sapphire crystal above the dial and water-resistance to 30 meters or 100 feet. 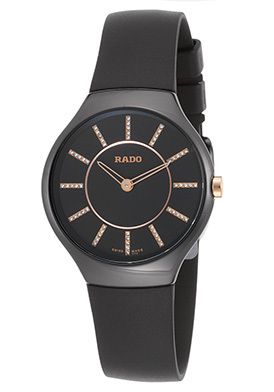 Rado True Thinline Diamond women’s watch is 30mm in diameter and 5mm thick. 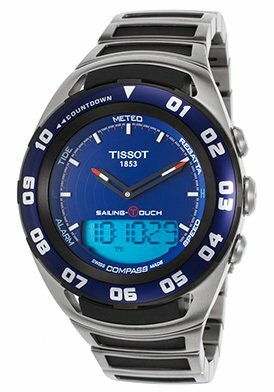 The Tissot Sailing-Touch Men’s watch is an outstanding sport watch gift. This Swiss-made timepiece features a state-of-the-art touch sensitive sapphire crystal above the blue analog/digital dial that lets you access various functions including compass, tide, regatta, meter, speed, chronograph and alarm count-down functions. The amply proportioned case in brushed stainless steel is presented on a matching brushed stainless steel bracelet with blue ion-plated stainless steel accent links. The blue ion-plated stainless steel bezel with screened markers completes the look. 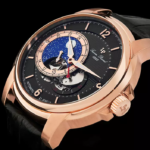 Features include luminous hands and hour markers on the dial, premium Swiss-made quartz movement inside, along with water-resistance to 100 meters or 330 feet. Tissot Sailing-Touch Men’s watch is 45mm in diameter and 15mm thick. 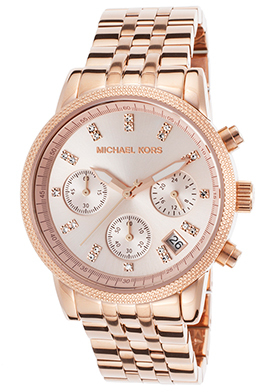 The Michael Kors Ritz Chronograph is a fashionable gift choice for women in rose gold-tone stainless steel. The generously oversized case and stylish multi-link bracelet in rose gold-tone stainless steel are highly polished to a mirror-bright patina. The stationary rose gold-tone stainless steel bezel with raised diamond-cut detail surrounds the rose gold colored dial with three sub-dials, luminous hands and sparkling crystal inlaid hour markers. Features include an automatic date window, small-second, 60-minute and 24-hour registers. Additional features include quality quartz movement inside and water-resistance to 100 meters or 330 feet. Michael Kors Ritz Chronograph is 37mm in diameter and 13mm thick. The Bulova Accu-Swiss Gemini Mechanical watch is a great gift choice for men. This Swiss-made mechanical men’s watch the contoured round case in polished stainless steel presented on a handsome black leather strap with contrasting white stitched detail and a push-button deployment clasp for added convenience and security. The stationary raised stainless steel bezel encircles the black dial with a small-second sub-dial, luminous sword hands and luminous Arabic numeral hour markers. Features include a scratch resistant sapphire crystal above the dial and water-resistance to 50 meters. 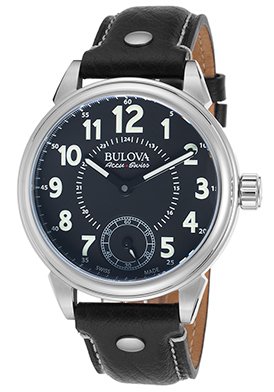 Bulova Accu-Swiss Gemini Mechanical men’s watch is 42mm in diameter and 12mm thick. Gift-giving holiday gift image courtesy of Wiki Commons.